I’ve been requested to bring a salad to a soccer game pre-party. Pasta salads are one go-to recipe I often include when casually entertaining or when asked to bring an item to a pot-luck. I always select a pasta that is easily managed with a serving spoon; a nice tidy pasta bow is much more practical than serving ribbons of linguini at any social event. Like most of life’s valuable lessons, I learned the hard way. I’ve watched in dismay as linguini slithered off serving utensils onto my freshly washed carpet. Almost worse is observing guests navigating the long noodles to their mouths while juggling their plate; another reason camera phones should be banned from social events! This pasta salad was the perfect accompaniment to the Barbecue Beef Sliders I made for the yesterday’s soccer game pre-party. I did bring my camera phone and was unable to record even one embarrassing pasta moment-nary a bow tie was dropped. 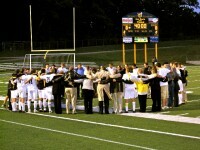 This was a very well-mannered group of parents; as long as their sons are not so gentile on the playing field–Go Hornets! When entertaining a large group, I am neurotic about accomplishing as much advance preparation as possible (see dinnerFeed for Aug. 21 Fajita Bar menu for more info on advance preparation tactics). I enjoy sharing do-ahead tips with you to make your last-minute entertaining scramble manageable. Advance prep: Make the sun-dried tomato dressing up to 48 hours in advance, leaving out the Parmesan, pine nuts, pasta and basil. The pasta can be cooked up to 24 hours in advance, tossed with olive oil, and refrigerated. Do not, however, combine the pasta and sauce. Up to 8 hours prior to the event, toss the sauce with garlic, Parmesan, pine nuts and pasta. Stir basil into salad just before serving then garnish as directed in the recipe. The finished salad fit perfectly in a 16″X 12″ aluminum tin, perfect for toting and serving at the game. Bring two pots salted water to a boil. In a food processor, purée the sun-dried tomatoes with packing oil, olive oil and garlic. If using goat cheese, process goat cheese into the mixture. Otherwise, stir 2 cups of the Parmesan into the mixture. Thoroughly combine sun-dried tomato mixture with mayonnaise. 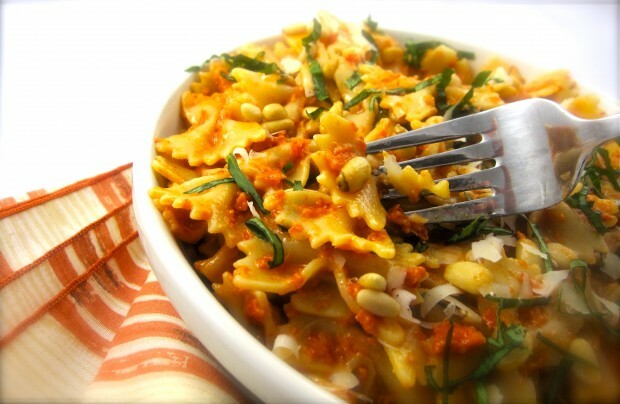 Toss with cooked pasta, 1 1/2 cups basil and 1 1/2 cups of pine nuts. Season to taste with kosher salt. Place in large bowl or container. Sprinkle top with remaining 1/2 cup pine nuts, 1/2 cup grated Parmesan and 1/2 cup basil. *Trader Joe’s carries pre-toasted pine nuts. I like mine a bit toastier than these but they aren’t bad and save a step in preparation.